Have you or your spouse/partner/civil partner ever had caravan insurance refused, cancelled, declared null and void or had special terms imposed? Please complete all fields highlighted red. Making sure dates are in DD/MM/YYYY format. This cover ensures that if your caravan is stolen or damaged beyond economical repair you will receive settlement based on the replacement cost as new (or equivalent specification) PROVIDED the sum insured reflects the full replacement value of an equivalent new caravan. In the event of a total loss, you will receive the current market value for the caravan at the date of incident PROVIDED the sum insured reflects the full replacement value of an equivalent second hand caravan. Is the caravan owned by you? Has your caravan previously been declared a total loss or written off? Are ANY additional forms of heating used (e.g. wood burning stove or portable non-electrical appliances)? Please complete all fields highlighted red. How many years caravan no claims bonus do you have? This should include the total amount the claim came to. Please complete all fields highlighted red. Making sure claim dates are in DD/MM/YYYY format. IMPORTANT - Please note the minimum security requirement is a Hitchlock along with a Wheel Clamp or Axle Lock. Is your caravan stored/kept in the United Kingdom? Does the caravan have an ACTIVE tracking system fitted? Where will your caravan be kept when it is not in use? These are in addition to the standard caravan security required. Underwriters reserve the right to check these details at any time. i.e. 24 hour security camera, security guard, fenced locked compound. How many days European cover do you require? Would you like to increase public liability cover from £1,000,000 to £2,000,000? ATTENTION: Please complete all fields highlighted red. Add breakdown cover from £15.00? Please tell us about the car you wish to cover with this policy. Your breakdown cover will start 24 hours after you receive your policy doucments. The issue of your breakdown documents may take longer if you purchase your policy during the weekend or Bank Holiday. Add legal protection for only £10.00? Compensation if you are injured and compensation for your family if you are killed. Recovery of your policy 'excess' under your Caravan insurance policy. Compensation for damage to your clothes, luggage or personal belongings if not covered elsewhere. Compensation for loss of earnings. Compensation for loss or use of your caravan. If you do not have Caravanner's Legal Protection to recover all of your uninsured losses from the other side, you could also lose any no-claims discount you are entitled to. When would you like these changes to start? Please note your policy is issued on the basis of these documents. If there are any points you are unsure of please do not hesitate to contact us. Details of your quotation have been emailed to you. You can recall your quote details at anytime by clicking on the link in the email. Please note cover is not effective until we have received payment and we have confirmed that cover is in force. You have opted to pay your insurance premium/s by monthly Direct Debit. Before proceeding, please can you confirm that your average monthly income less your average monthly expenditure exceeds the monthly instalment amount? Please note that this monthly Direct Debit facility is provided by Close Brothers Limited T/A Close Brothers Premium Finance (‘Close Brothers Premium Finance’). You are applying for a running account credit agreement with Close Brothers Premium Finance to pay your insurance premiums. The credit is not suitable for any other use. Any request for future drawings on the agreement should be made through us. In the event that you have any questions in relation to the credit being provided by Close Brothers Premium Finance, please contact us on 0870 990 7967. Please do bear in mind that your credit application must be completed via this website and cannot be completed by telephone. Is your regular monthly income sufficient to meet the monthly repayments for this finance agreement? After taking all your monthly outgoings into consideration, please confirm that your regular monthly income is enough to meet the monthly repayments for this finance agreement? Are you aware of any circumstances that could affect Close Brothers Premium Finance’s decision to offer you this finance agreement, including your ability to meet your minimum monthly payment on time for the lifetime of the agreement? The cost of the credit is made up of interest at the interest rate shown on the previous page. In certain circumstances, you may also have to pay administrative fees and Close Brothers Premium Finance will advise you as and when they arise. These costs, together with the APR, are also set out in a Welcome Letter and the Standard European Consumer Credit Information (SECCI) sheet which Close Brothers Premium Finance will send you if you are accepted. It is very important that you read all the information in the Welcome Pack and take time to consider it carefully. This information is aimed at enabling you to make an informed decision about whether or not this is the right product for you. A copy of the credit agreement will be sent to you in your Welcome Pack and you will be asked to sign and return the credit agreement to Close Brothers Premium Finance. A charge over the insurance policy forms the security for the credit agreement so your insurance policy is at risk of cancellation if you fail to meet your repayment obligations. If the credit agreement is cancelled in such circumstances, Close Brothers Premium Finance has the right to receive refunds paid under the policy. Any such amount Close Brothers Premium Finance receives will be used to reduce the amount you owe to Close Brothers Premium Finance. Close Brothers Premium Finance will pay all monies you borrow under the credit facility directly to us. Close Brothers Premium Finance may suspend your right to draw on the credit facility. Should you default on your credit agreement then the default fee of £30 will be payable. In the event of the arrears not being cleared by a specific date, which will be advised to you, Close Brothers Premium Finance may terminate your credit agreement and enforce the security given by you under the credit agreement. This will result in cancellation of your insurance policy. You will be liable to pay all sums owing to Close Brothers Premium Finance as well as any charges that Close Brothers Premium Finance may impose upon you. This may also affect your credit rating. You have the right to withdraw from the credit agreement for a short time after you have signed it. This will be fully explained in a Welcome Pack which Close Brothers Premium Finance will send you if your application is successful. If you validly withdraw, the credit agreement is treated as if it was never entered into and you must repay the amount of credit within 30 days beginning with the day after the day you notified Close Brothers Premium Finance of your intention to withdraw. You will have to make alternative arrangements with us to pay for your insurance cover. You can repay the credit agreement at any time, either in full or in part. Where partial repayment is made you must continue to meet the remaining minimum monthly repayments, unless Close Brothers Premium Finance has notified you in writing that the minimum monthly repayment has been reduced. You can obtain further information by contacting Close Brothers Premium Finance on 0870 990 7967 or by writing to Close Brothers Premium Finance at Close Brothers Premium Finance, 21st Floor, Tolworth Tower, Ewell Road, Surbiton, Surrey, KT6 7EL. The next step will be to set up the Direct Debit Instruction to enable Close Brothers Premium Finance to debit your bank account with the minimum monthly repayments. Direct Debits can now be set up online. All the normal Direct Debit safeguards and guarantees apply. Is the account that is to be debited in your name and are you the only person required to authorise debits? If your application is accepted, Close Brothers Premium Finance will send you by post the information you need before signing up to the credit agreement. You will be sent a copy of the credit agreement which you must sign and return to Close Brothers Premium Finance at the address provided. In future if there is a change to the date, amount or frequency of your Direct Debit, Close Brothers Premium Finance will always notify you 2 working days (a working day being any day other than a Saturday, Sunday or public holiday in England) in advance of your account being debited. In the event of any error, you are entitled to an immediate refund from your bank or building society. You have the right to cancel the Direct Debit Instruction at any time, and this guarantee is offered by all the banks and building societies that take part in the Direct Debit Guarantee. A copy of the safeguards under this guarantee will be sent to you with Close Brothers Premium Finance’s confirmation letter. Please note that under the terms of the credit agreement, you must pay each minimum monthly repayment by Direct Debit. Thank you very much for your Direct Debit Instruction details. 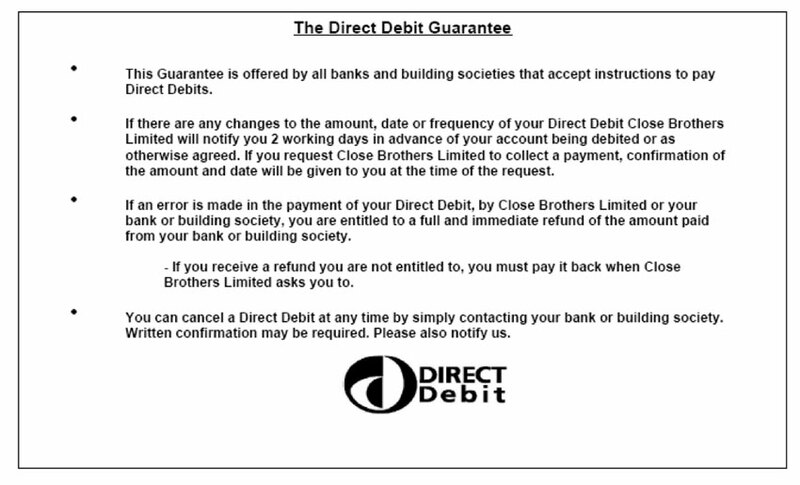 Here is the Direct Debit Guarantee for your information. I have read the keyfacts document and understand this is a summary of the policy covers. Please correctly complete all fields highlighted in red adhering to our terms of business. You are unable to proceed until you have agreed. Unfortunately you have not met the required criteria to purchase your policy by monthly payments, please return to the previous step to complete payment by debit or credit card. IMPORTANT - Unless any agreement to the contrary is reached between us, this contract is subject to English law and all communications will be in English. MATERIAL FACTS DEFINITION - Material facts are those that are likely to influence an insurer in the acceptance of this proposal and it is essential that you should disclose them. If you are in doubt as to whether a fact is material then, for your own protection, you should disclose it since failure to do so could affect the operation of your policy. YOUR DUTY OF DISCLOSURE - You must take reasonable care not to make a misrepresentation to the insurer. This means that all the answers you give and statements you make as part of your insurance application, including at renewal and when an amendment to your policy is required, should be honest and accurate. If you deliberately or carelessly misinform the insurers, this could mean that part of or all of a claim may not be paid. Frank Pickles was established in the 1950 and became a limited company in 1960. It is now run by third generation Pickles family members. As a long established, family run business we can provide a much higher level of service than most of our competitors. Our senior members of staff have combined experience of over 50 years. ATTENTION: Due to the storage postcode your insurance will NOT provide flood damage cover.